A typical network time synchronization scenario is depicted in the diagram shown below. In this scenario, each workstation synchronizes to a central time server on the corporate LAN. The server operates PresenTense Time Server software to synchronize its own clock to both the in-house GPS Master Clock and atomic clock time sources on the internet. Each work station in turn operates PresenTense Time Client software to synchronize to the corporate server. This model gives the accuracy of a local GPS clock as well as leveraging internet based atomic clocks as a backup source. 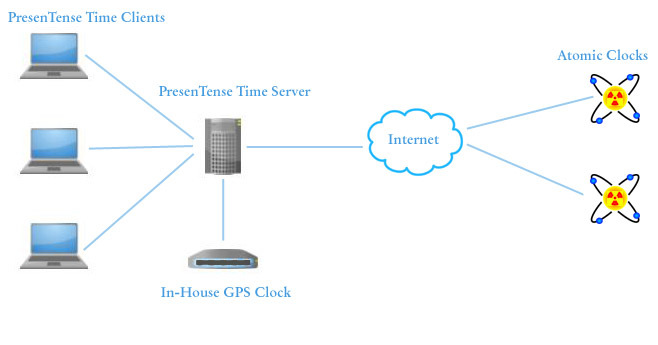 For applications where time accuracy requirements are even higher or corporate security policies do not allow external time source synchronization, PresenTense Time Server can be configured to synchronize with multiple GPS time sources.